Encinitas Country Day School Students are provided a solid academic foundation through individualized language arts and mathematics instruction, and are introduced to the world and their place in it through Montessori hands-on presentations and projects, designed to orient them to their time and place in the universe. This provides a broad foundation for elementary geography, geology, astronomy, history, social studies and science lessons. Encinitas Country Day School’s curriculum is correlated to current California State standards and enriched by hands-on learning in Montessori prepared environments. In addition students are challenged with projects designed to reinforce concepts and apply learned academic skills. A nationally-normed test is administered each spring to provide accountability and document ongoing student improvement. Individualized reading, language arts, spelling, writing and vocabulary curriculum meet or exceed state standards and assure students achieve academic goals. Students are assessed and placed in our adopted, literature-based reading program according to their individual reading and comprehension level. Selected traditional and Montessori reading materials reinforce academic concepts and prepare students for traditional programs and testing. Hands-on Montessori materials support learning of grammar, language mechanics, spelling and vocabulary. Traditional instruction, and workbooks reinforce learning and provide practice. Book reports, subject area projects and problem-based collaborative learning challenges give students opportunities develop written and oral communications skills and prepare for middle school. 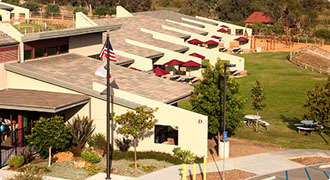 Encinitas Country Day School faculty use various authentic, classroom and computer-based assessment methods to monitor student progress, oversee student success and provide accountability. Standardized, nationally and locally-normed tests are administered each spring in all grades. Elementary aged students learn traditional math concepts using hands-on Montessori mathematics materials. Each exercise is designed to engage students in discovering the concrete basis for important mathematics processes and formulas. Once learned, students practice mathematics using traditional methods. At Encinitas Country Day School students excel in mathematics because they understand the process that determines the formulas used and can more easily solve mathematics problems using their expanded understanding of the concepts. During fifth and sixth grade our secondary mathematics instructors prepare students for their transition into our traditional middle school by providing longer periods of traditional mathematics instruction. Note: Many educators have attempted to discover and address the reasons American students have fallen behind their peers around the world. In 1991, the National Sciences Foundation funded a project to support greater understanding of the foundations of mathematics in the middle years in order to improve outcomes for high school graduates. In fact, the project proved to be a solution that brought the academic scores of students who attended the middle school pilot program back into the worldwide lead at high school graduation. The successful project provided middle school students with manipulable models and visual representations of important math concepts as a foundation for all future mathematics learning. Their work validated the Montessori approach to mathematics instruction and provided an alternative method we could offer our incoming middle school students who may not have received the benefits of the concrete connections students experience in our Lower School Montessori mathematics program. Encinitas Country Day School facilities include a Science Lab with Vernier wireless lab equipment, Media Center/Computer Lab, Library with on-line research access, organic gardens and an on-campus conservation area with native habitat, a seasonal stream and access to the San Elijo Ecological Reserve. Students have age appropriate access to facilities and instruction at each level. Classroom materials to support aligned science curriculum content and Montessori “great stories” that provide students with a geologic perspective of their time and place in the universe, and include important lessons in biology, earth and physical science, make every day learning in our lower school classrooms challenging and fun. Visits to our science lab enrich classroom learning and provide experience using the scientific method. Students begin their zoology and botany studies with the two kingdoms of life which they encounter most frequently in their own lives, plants and animals. Through experiments, charts, nomenclatures, and research projects they learn about types of plants, their needs, their life cycles, their parts and functions, and their importance as oxygen producers and food sources for other living things. Concurrently they learn about chordates (vertebrates) and non-chordates (invertebrates), the scientific classification system, the external and internal parts of the five classes of vertebrates, and their life cycles. Life Science concepts are firmly tied to the children’s study of the history of life on Earth, as discussed in the Social Sciences curriculum overview. The six phyla of non-chordates are presented in the order in which they appear in the fossil record. The plant life of prehistoric earth is explored, with special emphasis on the types of plants, such as conifers and flowering plants, which most influenced the development of animal life. Animals and plants from the Paleozoic through the Cenozoic Eras are introduced with the Time Line of Life, and studied in depth through presentations, concrete materials, and research projects. Children learn the concepts of biomes and ecosystems, and the adaptations of plants and animals to the areas they inhabit. The evolution of human life is introduced with the Time Line of Humans, and the major stages of human development are explored and extensively researched. Finally, younger students are presented with the six kingdoms of life, in preparation for biology studies in the upper elementary levels. Upper Elementary students begin their biology classes with a look at atoms as the basis of all matter, the formation of molecules, and the types and structures of cells. Their studies then focus on the first four kingdoms of life (archaeobacteria, eubacteria, protists, and fungi). The systems of chordates and non-chordates are compared and contrasted. Human anatomy and systems are presented. The plant kingdom gets another look, with a focus on the internal structures and cellular level biology. In addition, basic chemistry classes begin to prepare students for Middle School science requirements. Finally, Lower School students take an in-depth look at Ecology, the cycles of gas exchange, the biomes of the planet, how food chains work, and the impact of human activity on the ecosystem, as well as possible solutions when that impact is negative. All upper elementary classroom presentations are supplemented by laboratory classes in our fully equipped lab with our Middle School Science teacher, a wide variety of concrete materials such as charts and nomenclatures, and many opportunities for individual and group research projects. Our students learn the basics of keyboarding in their classrooms. Technology classes provide students an opportunity to learn important computer-based programs for word processing, spreadsheets and database and progress in sophistication as students move through their school years. Technology instruction is translated cross-curriculum to support student projects in the Science Lab, Art Studio, Performing Arts and on stage, on iPad apps used for math and science classes and in using online research capabilities available through our Library, Media Center, and throughout the school. Technology instruction helps students develop skills and master popular software such as Microsoft Office. Students learn to apply computer skills to core subjects such as reading, writing, and mathematics. Each lesson is aligned to current California State Standards in both the core subject and the technology skill. In fact, most technology skills are written into the state standards under each of the core subjects. To this end, we also incorporate class projects, research, essays, creative writing, and poetry into our computer classes. The end result is that students receive tangible and useful reinforcement of key academic concepts, while they progress toward technology literacy. In addition to their technology classes, students have access to computers in each classroom, and practice typing skills regularly on special keyboards, which are programmed to provide sequential lessons in keyboarding, opportunities for regular practice, and periodic testing. At Encinitas Country Day School, history and social studies instruction begin by providing students with the elementary “great stories” that provide a perspective on the time and place our students live. Through these stories, students begin to understand time and its measurement within local, world and geologic time frames. With the study of time, students are better able to understand their own place in the world as their study of early man and recorded history includes primitive, historic and current cultures and events. Our youngest students are introduced to the diversity of the world’s cultures and customs with an overview of world geography in their study of the continents. Aligned third and fourth grade studies include an overview of our 50 states and a study of the missions that settled our own state. Fifth and Sixth grade studies of American and world history include world civilizations and the founding and expansion of our country. 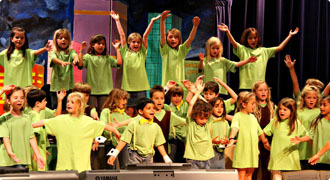 Encinitas Country Day School has traditionally made the unfolding character of its students a top priority at all levels. 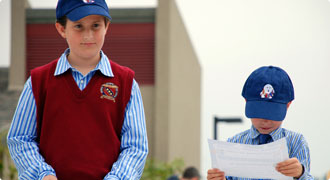 A primary element of the school’s character education policy is the high level of supervision students receive. Teachers are charged with attending to the character education of their students. Guidance and support are available from the administration, in the school library and in the adopted character education standards and curriculum materials provided to all grades. Teachers receive in-service training to implement the various policies and use the adopted programs within their classrooms and school-wide. In addition, our principal has established monthly Character Assemblies to support a deeper understanding of a character quality and provide examples of that quality in action. The assemblies involve each grade taking a turn to present an important character concept to the entire school. The ultimate goal is to work as a team, in concert with parents, to support our students in becoming the balanced individuals of “scholarship, integrity, and service” we’ve envisioned in our Expected School-wide Learning Results (ESLR’s). Lower School (K-4th Grade) physical education classes include standards-aligned grade level classes and athletic instruction. Beginning in third grade, students receive a weekly Olympic-style Taekwondo classes led by Master Smith, a certified master instructor holding a fifth degree black belt from the World Taekwondo Federation. Fifth grade students have options to participate in the middle school athletic league.